total time. It was no problem. It flew great." Helio, of course, is no longer producing aircraft and is virtually defunct, but Davis predicts "somebody will pick the Stallion up and put into production someplace. There are a lot of inquiries. The Department of the Interior wanted me to demonstrate it in Boise. There's a possibility that some of the military agencies are interested for overseas operations. "There's some Canadian interest. I could put three of them to work in Canada right now." He estimates an initial market for 50 a year for the first two years and 10 annually thereafter, but says "the people I'm with, there's no way they can produce the airplane." He adds, "I'd like to see the Stallion returned to production, and I'd like to go to work for'em. That would be my goal." Powered by a Pratt & Whitney PT-6A-27 680 shp turbine, the AU-24s cost the government $292,000 each in 1972. Since the, the cost of engines has jumped by $50,000. 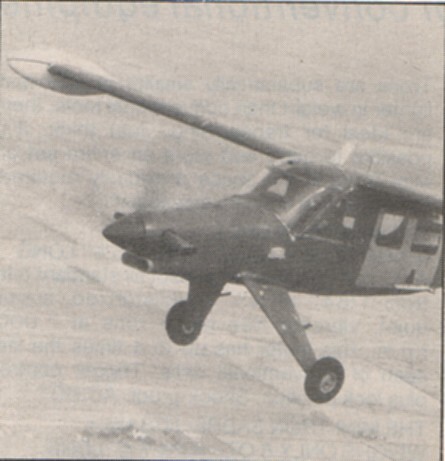 Unlike the one-off civilian certificated Stallion, which had a certificated gross weight of 5,100 pounds, the AU-24s were flown by the military at 6,300 pounds gross at a 3G load. There are over 300 minor modifications to the military bird, mostly to fit it for a spotter/ground attack role. That's why it took Davis over a year to get the airplanes recertificated in the standard category. During that time, I flew the AU-24 twice, once from the right, and once from the left seat, and found much that was familiar. The business office is almost identical with the civilian H-550A, a gray panel with torque-meter, tachometer and flowmeter prominently displayed. There is the same machined aluminum "T" handle on the power lever, a hefty bangalore torpedo-shaped affair hefty enough to chin yourself on. The stick was purely military, a great curved club with a shaped grip, festooned with buttons to control radios, guns, bomb and rocket releases. Starting involves fuel transfer pump off, fuel shut-off (red knob) on, starting control on full increase, generator switch off, battery on, boost pump on, and at least 5 psi on the fuel pressure gauge. At that point you flip the combination starter-ignition switch on, watch the tach wind and the battery drain and when the PT6A has stabilized for five seconds on at least 12 percent, move the starting control to low idle. perature is 1090o C, and should decrease promptly as the engine begins to idle. Finally, cut-in the generator at 65 percent rpm to recharge the battery, because starting takes alot of juice. And you're in business. Actually, starting is simple; it just sounds complicated. Davis contends it's easier to start than a piston engine, and if you boil it down to switch-flipping and button-pushing, it is. But the Helio ancillary systems get more frequent use than normal airplanes, and there are alot more gauges to watch. Different ones, anyway. There's some retraining required. The big three-bladed paddle prop out front moves lazily around, slowly picking up speed as the turbine lights off, and by the time the engine has stabilized, the prop blades have come out of feather and gone to work. Fortunately cabin soundproofing is excellent, because outside, close-up, the pervasive whine of the machine is almost unbearable. The droop snoot slopes away ahead of you, the massive windshield wraps around and over you and, since your eye level is nearly nine feet in the air, the effect during taxi is like riding in a space-age elephant howdah. At the far end of the runway, the before take-off checklist consists of mainly scanning the forest of instrument faces. Basically the Stallion is a very simple airplane. The beauty of a turboprop is, you set the prop governor for desired rpm (generally 2,000-2,100) and forget it. From then on, you do all your flying by advancing or retarding the power lever. To me, there has always been a curious lack of feel to the Stallion, both on the ground and in the air, and the military version is no different. I remarked that, although just about any pilot could check out and fly the plane in an hour or two, it would probably take 50 hours before he would. Davis quickly.